← 2017 Zayed Future Energy Prize winner is Bolivian! Moreira, an ally of socialist President Evo Morales, has been harshly criticized for her handling of the water crisis by civil society groups, the opposition, and even ruling party lawmakers. to avoid being censured by the legislative assembly. 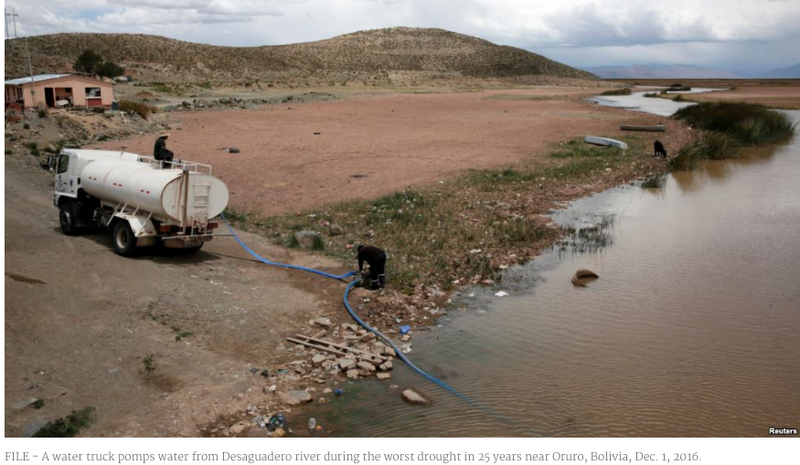 The South American country declared a state of emergency due to the drought in November, after residents of El Alto, near La Paz, briefly held authorities with a local water-distribution company hostage to demand the government explain its plans to mitigate the shortage. The government of the demagogue coca grower caudillo has failed big time! This political “move”, to resign before been questioned is a cheap trick of the ruling ochlocracy. This incompetent government had “nationalized” the water distribution system in La Paz and the water shortage in the capital of Bolivia is due to that irresponsible management. After eleven years on government, controlling ALL State powers and with incredible revenues generated due the high export process of pur commodities, had resulted in wasting over $180 billion dollars and no previsions to tackle droughts or improve the water system distribution, they only misspent public funds! This entry was posted in Bolivia, Environment, Health, Politics, Social Unrest and tagged corruption in public office, demagogue, drought, government failures, Ochlocracy, public policy failures, water. Bookmark the permalink.